ABSOLUT (Mandarin Orange) is the newest ad in the ABSOLUT MANDRIN SERIES and can be found on page 193 of the 10/99 issue of Ocean Drive mag. It is very similar to the ABSOLUT MANDRIN ad, showing a bottle of Absolut Mandrin Vodka on a shiny blue surface, in a white spotlight, against a blue backdrop. 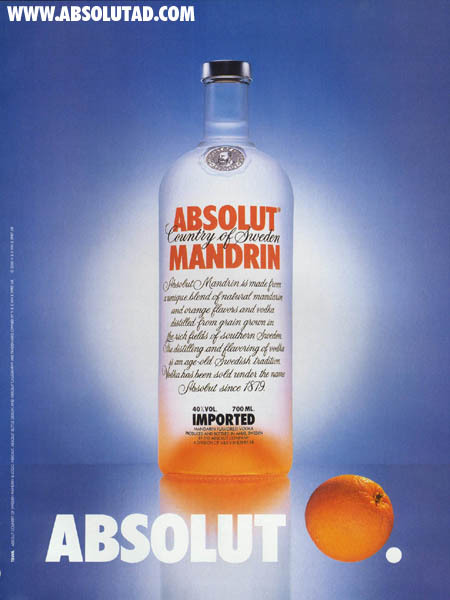 However, it's the Absolut logo that's different and unique: across the bottom of the ad is the word ABSOLUT (in white), followed by a picture of a Mandarin Orange (about 50% larger than the word), then followed by a white period. This 1999 ad was photographed by Steve Bronstein.